These Farm Heroes level 67 cheats and tips will help you beat level 67 of Farm Heroes. 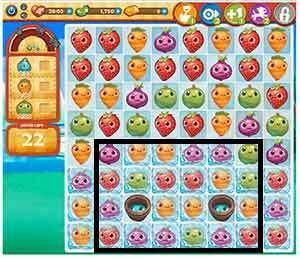 The objective of Farm Heroes level 67 is to collect 22 water, 60 carrots, and 60 green apples. 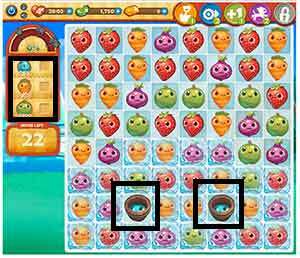 In Farm Heroes 67 you have to collect 22 water. You must first reach the water buckets before you can even make water appear on your board. This is why your first moves should be focused around freeing at least one side of each water bucket from the ice around the frozen cropsies. Focus on trying to get to the water buckets from the top side of the bucket. That is the easiest side to free open. Level 67 of Farm Heroes Saga is so difficult because of the water. The whole time you are playing you should just focus on collecting the water. 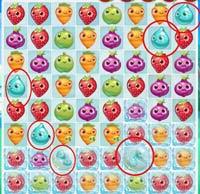 Dont worry about collecting the carrots and apples because those will automatically be collected with the cascading matches made when working on breaking the ice and collecting the water.